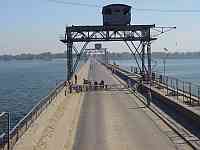 January 2005 trip to Egypt. 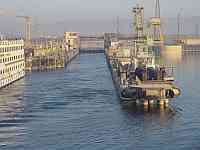 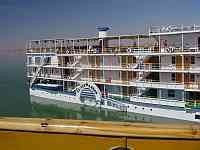 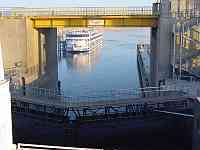 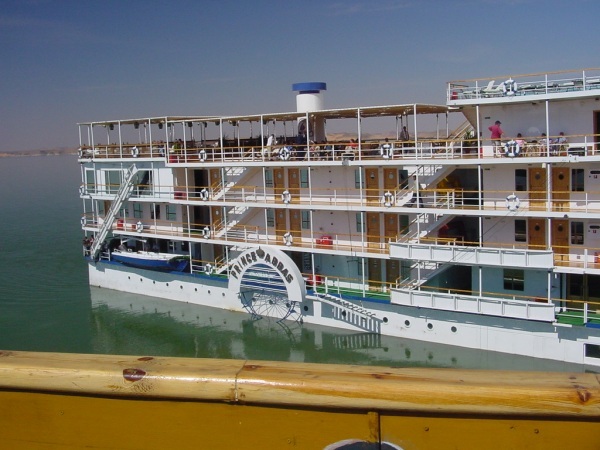 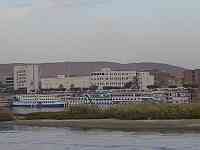 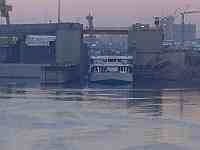 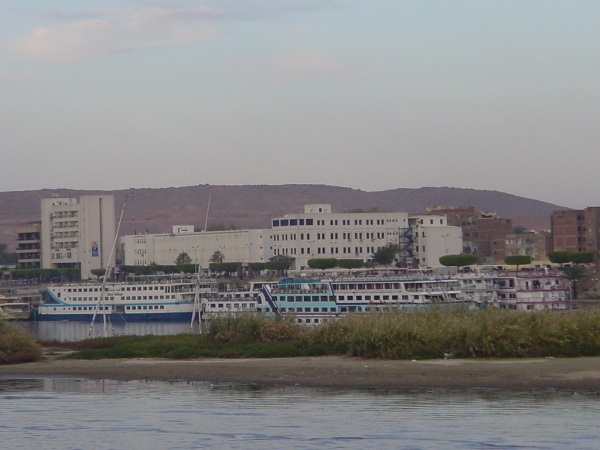 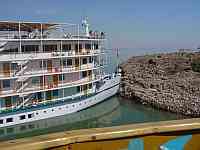 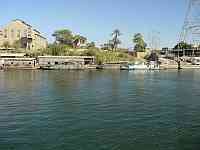 The cruise ships on both Lake Nasser and the Nile are are built to the same dimensions, ie 70m long x 14m wide. 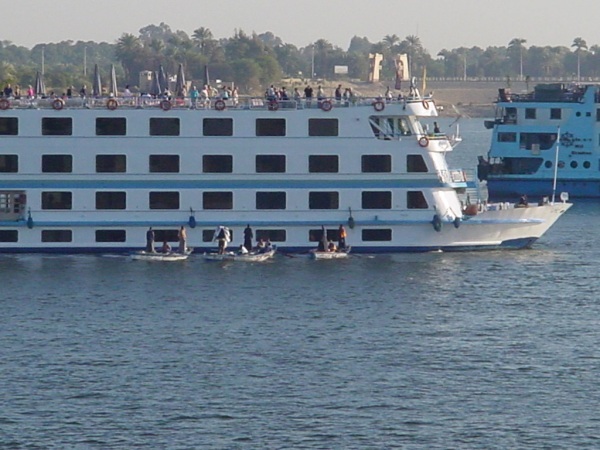 They are shallow-drafted and flat bottomed, carrying between 100 and 200 passengers; they do not appear to have bow-thrusters, but have 2 or 3 engines of 500hp each as well as 2 or 3 powerful generators. It is interesting to see how they are handled. 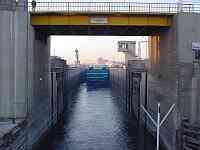 If you are familiar with boating on the English canals, the answer is "just like that". 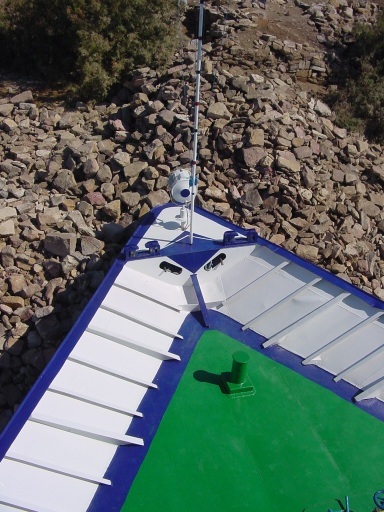 The bows are used for mooring, pivoting, etc; ropes are used to pull the boat around when power-steering doesn't work, although a really sharp turn is accomplished if one of the engines is suddenly put into full astern while the other is running hard ahead. 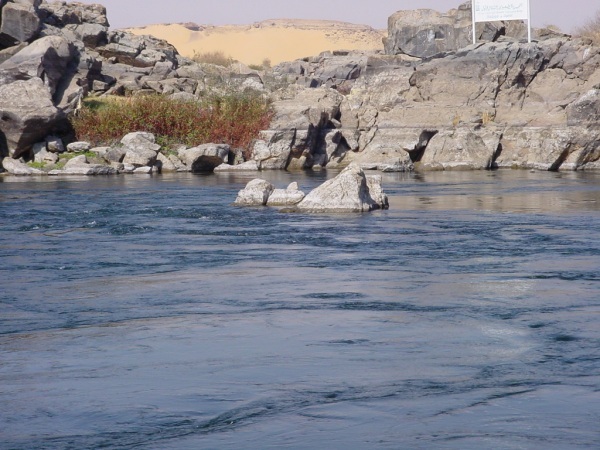 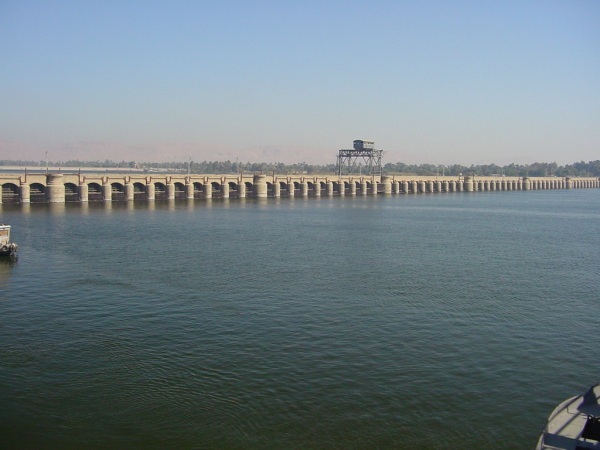 Lake Nasser is a 500km artificial lake extending 300km from Aswan to Abu Simbel which is 50km from the border with Sudan; thus the southernmost 150km of the lake is in Sudan. 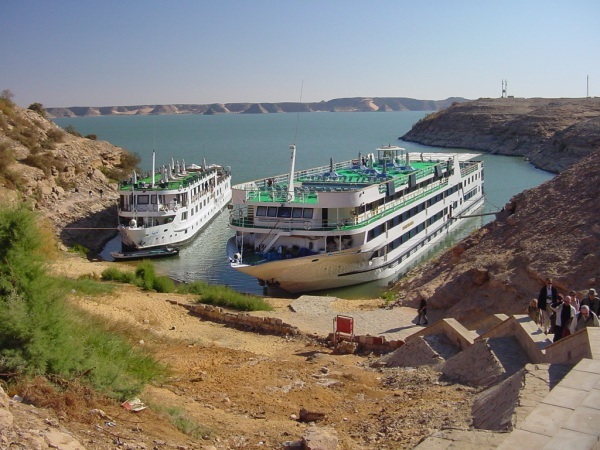 There are only a few large boats on Lake Nasser: just 3 or 4 cruise-ships plus one ferryboat which travels from Aswan to the Sudan but is only recommended for the truly adventurous. 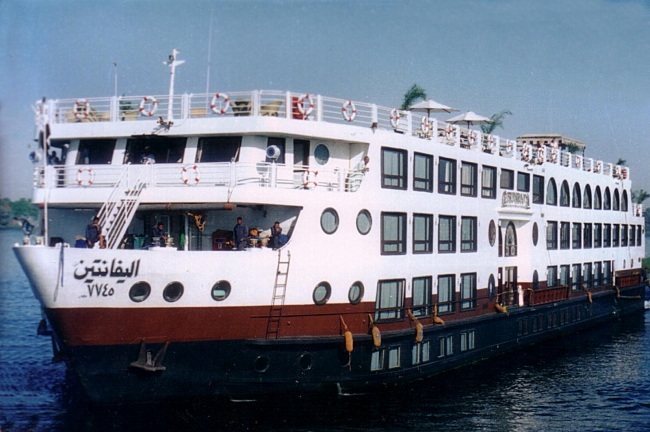 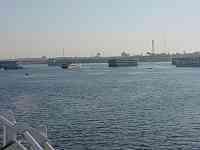 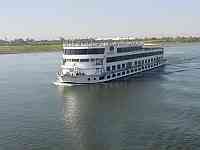 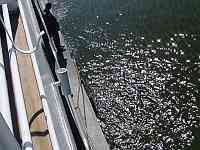 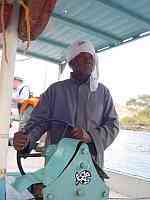 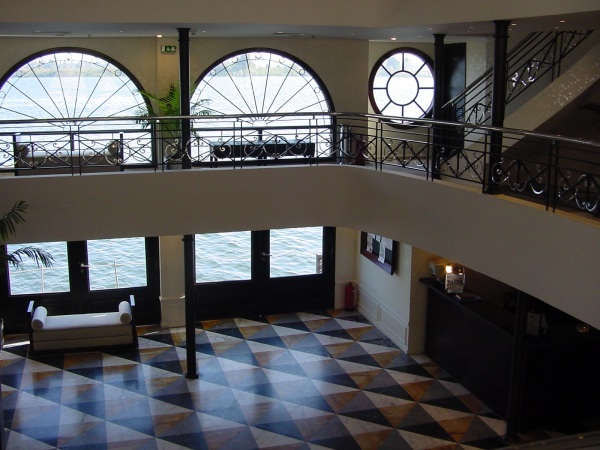 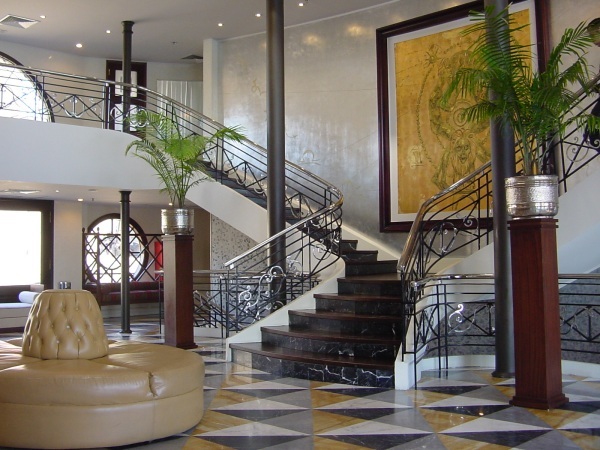 We travelled on the M/S Nubian Sea, which was very luxurious. 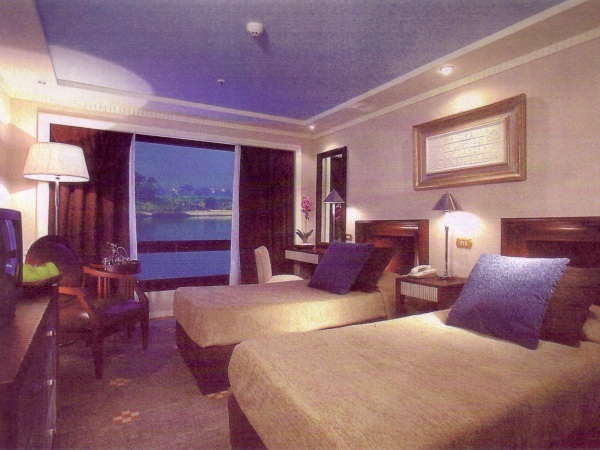 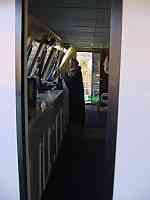 One point to note is that the cabins are very well appointed, with full air-conditioning but no heating. 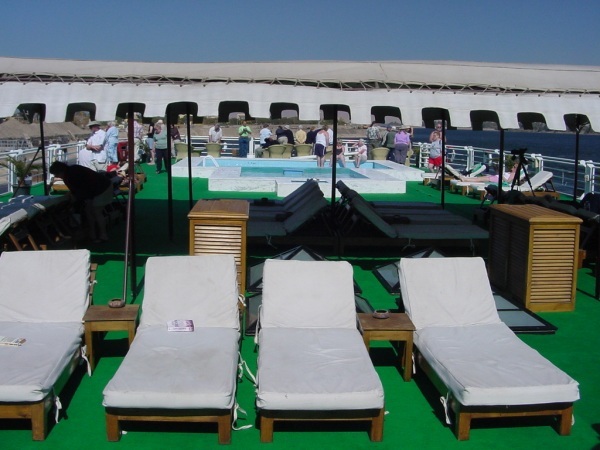 As it was January it actually got quite chilly at night; whenever the crew made up the beds, they instinctively turned the air-conditioning to maximum and it was essential to switch it off again before the evening. 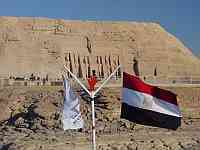 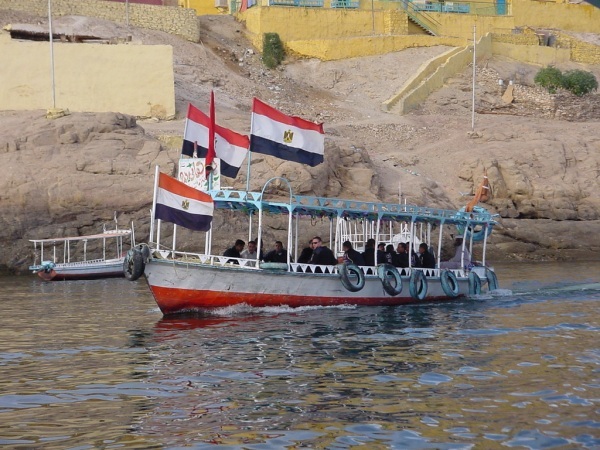 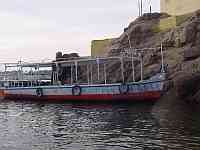 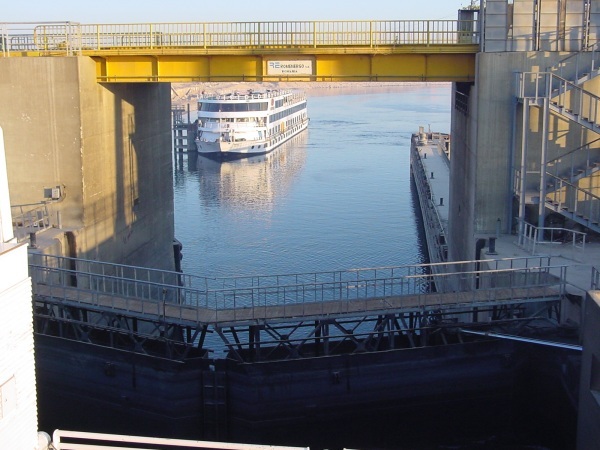 At the sites between Abu Simbel and Aswan, there are no mooring facilities for the ships. Instead, the ships boats are used to ferry passengers ashore; a degree of balance is needed to use their gang-planks for this purpose. 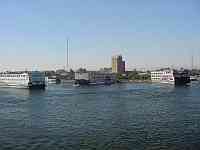 By contrast, there are just too many ships on the Nile. 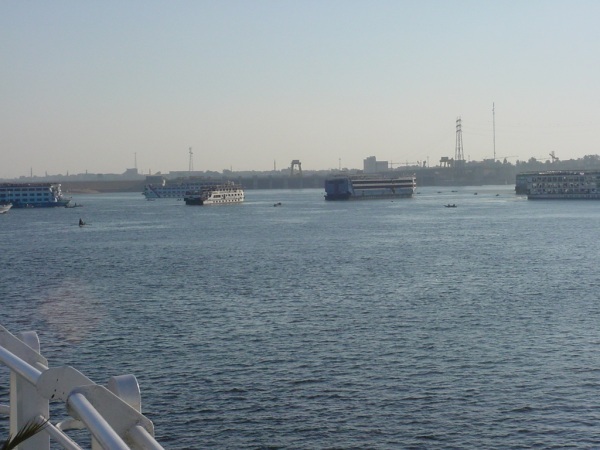 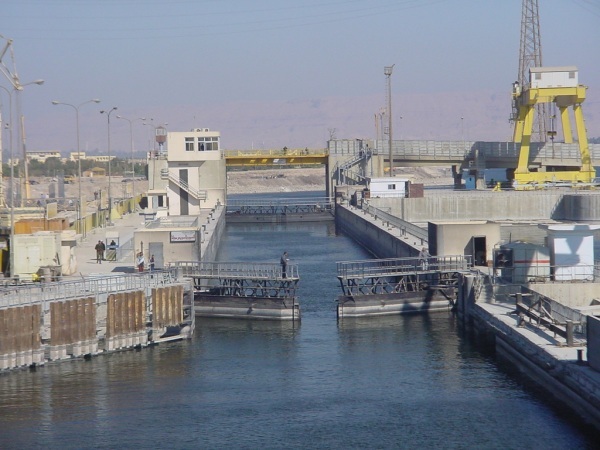 At least 300 ships compete for the limited space, which leads to congestion at places such as the lock at Esna (we had to queue for 15 hours there). 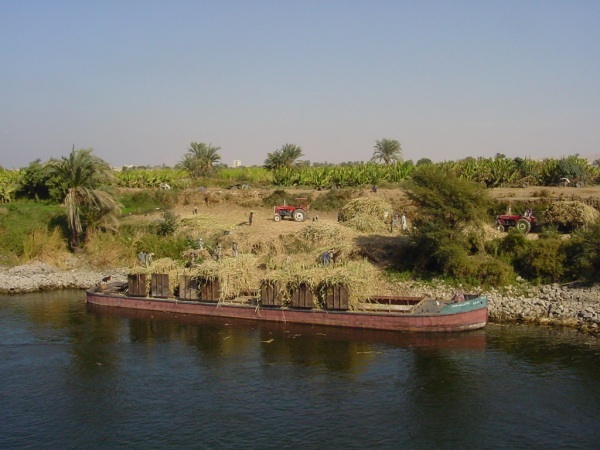 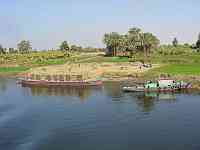 That means at least 30,000 tourists on the Nile at any one time, which can make the sites very crowded; the Valley of the Kings seemed to be more like a theme park than an ancient burial ground. 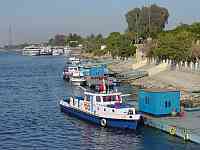 Moorings at the main towns are in short supply; the boats typically spend the night moored 4 or 5 abreast and to get ashore you must walk through the reception areas of the other boats, which gives you the chance to make comparisons. 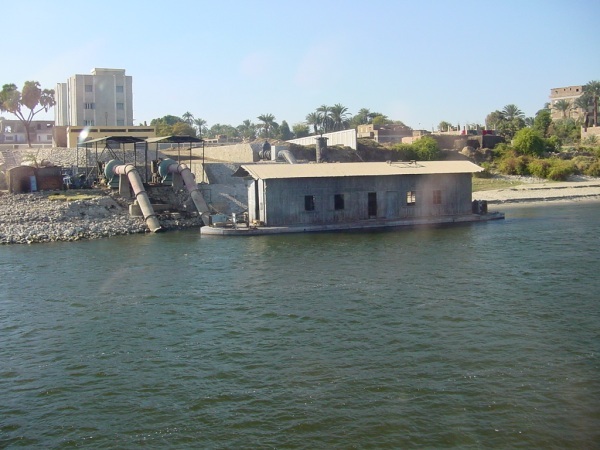 This means that it is generally quite noisy at night - mostly because of the sound from the generators of your neighbours. 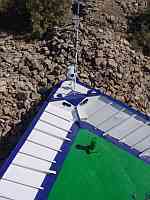 Apparently this was particularly noticeable from the most expensive suites which are right at the front of the boat, just a few feet from the generators of the boat in front! 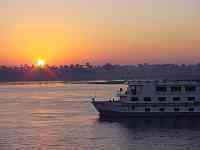 We travelled on the M/S Sun Ray, which was more luxurious than our wildest dreams. 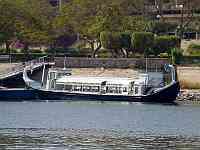 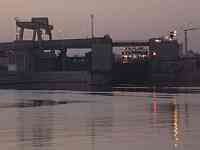 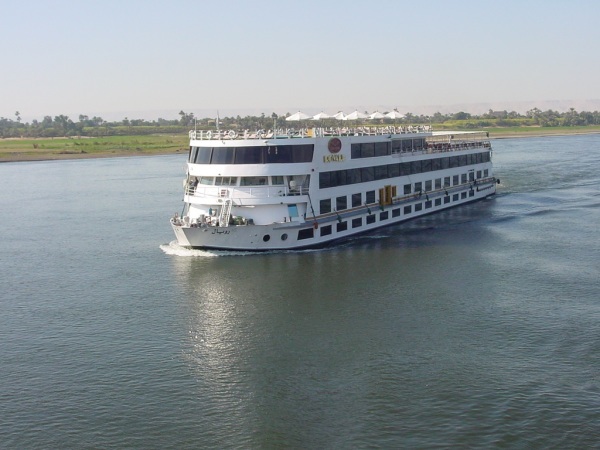 One of the newest ships on the Nile she has every conceivable facility except, again, heating for the cold nights. 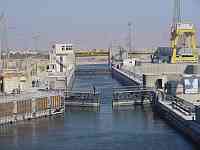 There is just one lock to negotiate, at Esna. 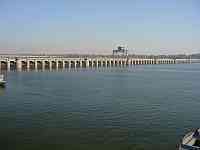 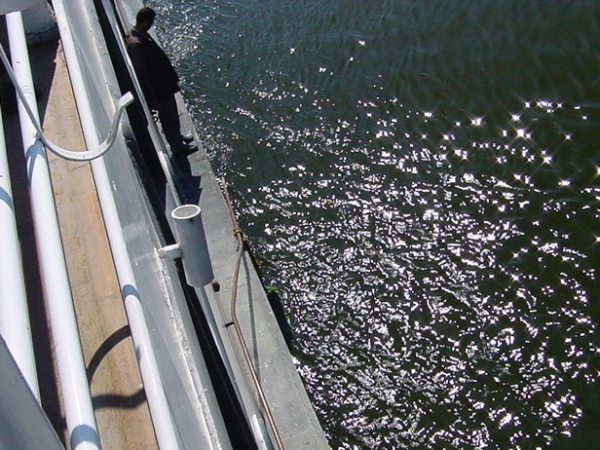 This measures 150m long x 15m, so will take two boats end-to-end. 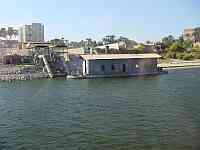 There is a 15m rise, and the complete cycle takes about an hour. there is plenty of space on either side of the lock, but only limited mooring, so the waiting ships drift or anchor, or place their bows up the bank while they wait. 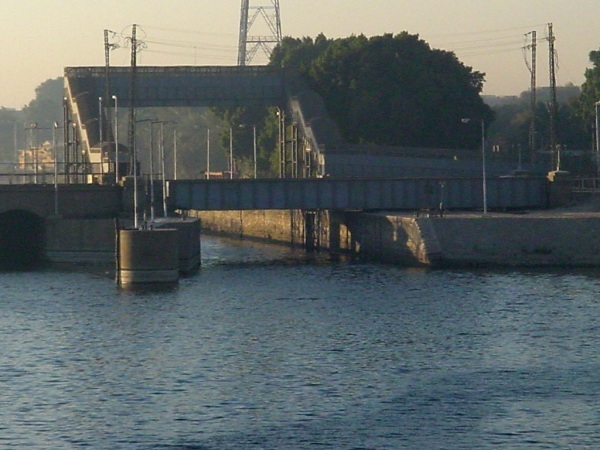 After passing through the lock, there are only a few hundred yards before the next obstacle, which is the old "English Lock" which was only just big enough to take one boat. 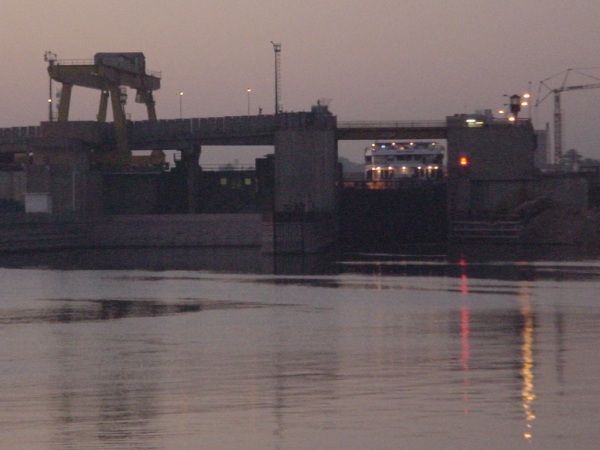 Although now no longer in use as a lock, it still has a swing bridge across the chamber which is only swung for a few minutes every four hours. 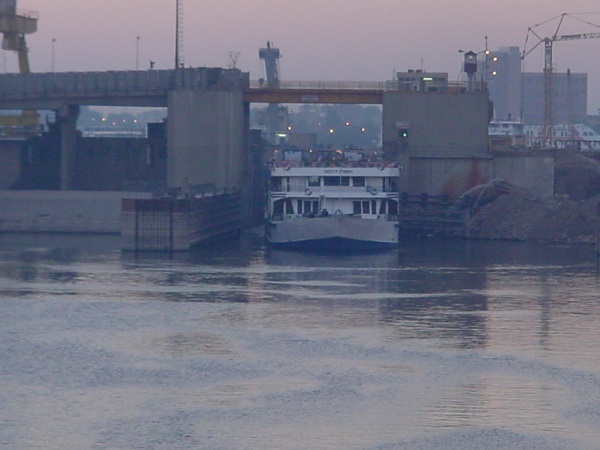 The locking technique seems to be to aim the ship a little too far to the left as the lock is approached, and to drop ropes from the bow and then the stern on to the right-hand lock-side bollards. 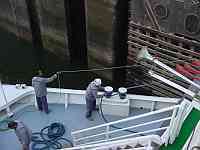 The forward movement of the ship tightens these ropes and pulls the ship to the right until it is on the correct line, then the winches are released and the ropes are rapidly picked up and transferred (by hand) to a bollard further forwards. 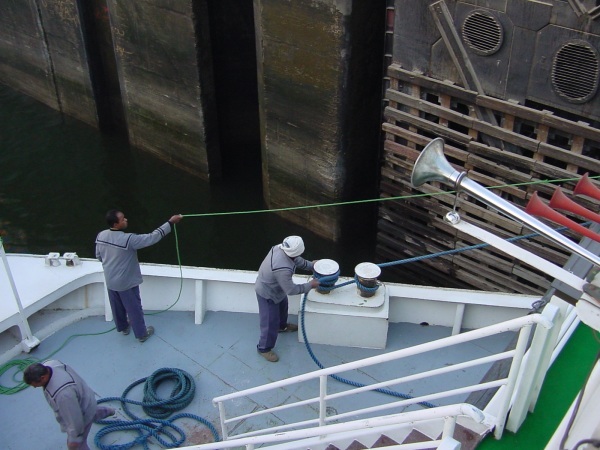 In this way the ship is manoeuvred through the narrow lock chamber; but if the rope isn't loosened quickly enough, as happened in our passage through the English Lock, the ship is pulled hard to the right. 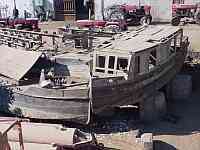 this lost us a fender and also the handrail to which it was tied. 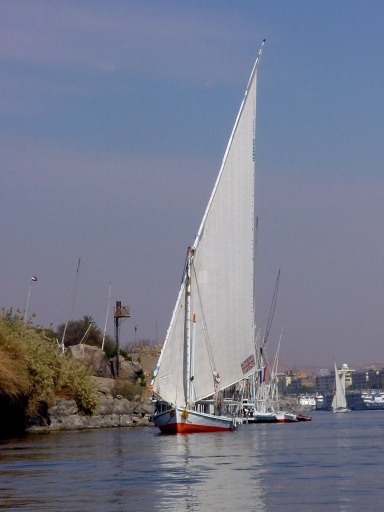 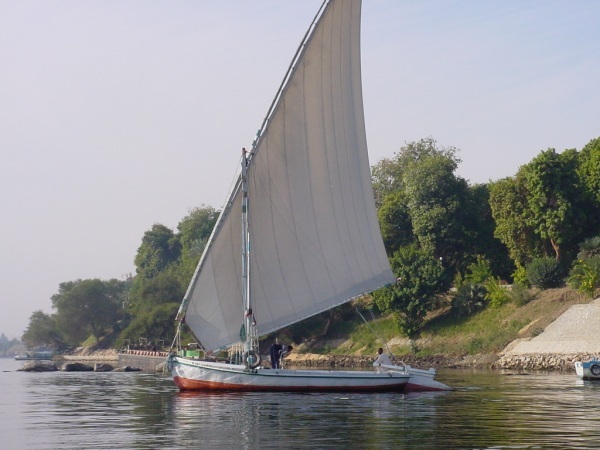 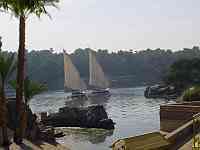 The traditional sailing boats on the Nile are called Feluccas, and are plentiful around Aswan. 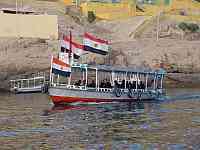 They come in a variety of sizes, but naturally they are mainly used as a tourist attraction now. 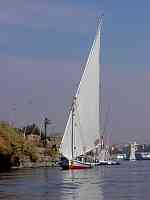 They have a single, distinctively shaped sail with a tall gaff; oddly enough the boom is not attached directly where it meets the mast, but is instead held by a chain from the foot of the mast to the fore-end of the gaff. 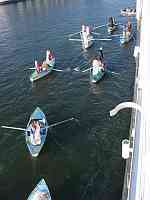 They have a heavy centre-board, but ours seemed to make very poor headway when tacking into the wind. 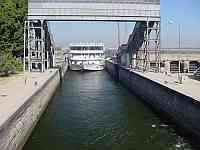 As we were behind schedule going back downstream the captain decided to travel all night to be at the head of the queue for Esna locks. 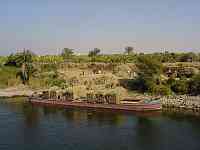 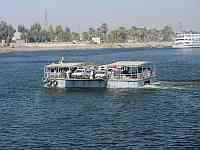 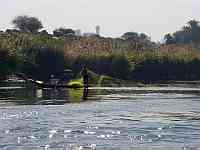 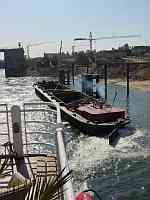 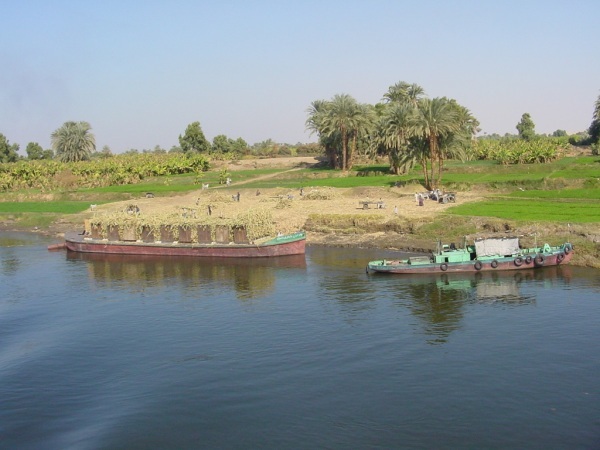 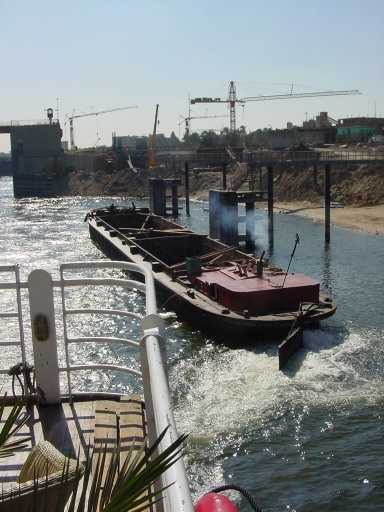 Unfortunately the river level was very low, and in the darkness we ran aground on a sandbank near Kom Ombo.. 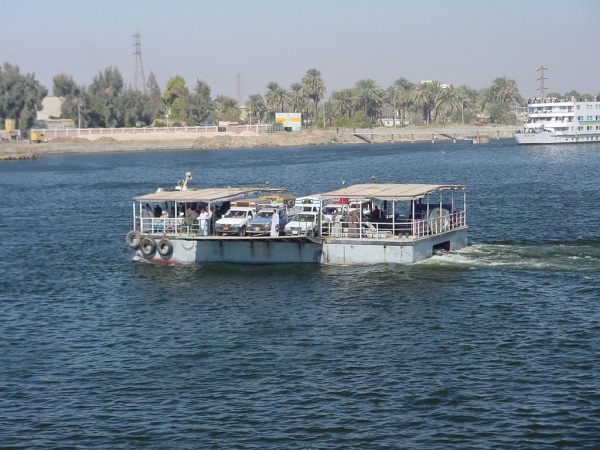 The first attempt to drive off the sandbank merely turned us through 180 degrees then swept us sideways so that the bows were hard into the bank just upstream while the rear quarter was still stuck on the sandbar. A crew member then went down a ladder to check the condition of the bank, and reported that it was soft sand so the captain decided it was safe to use the bulk of his 1500hp to pivot on the bows and force the stern upstream before reversing hard to pull us back into the deep water. 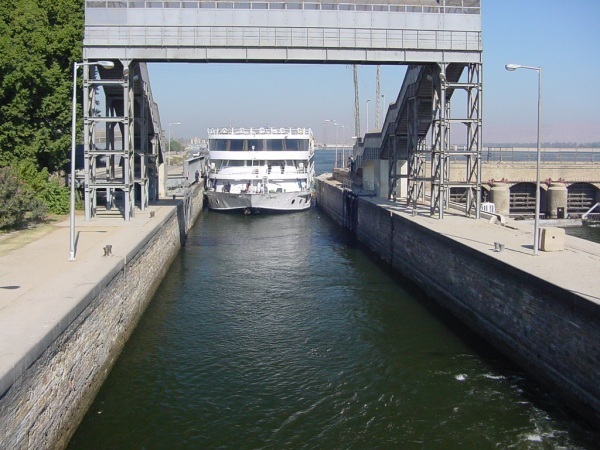 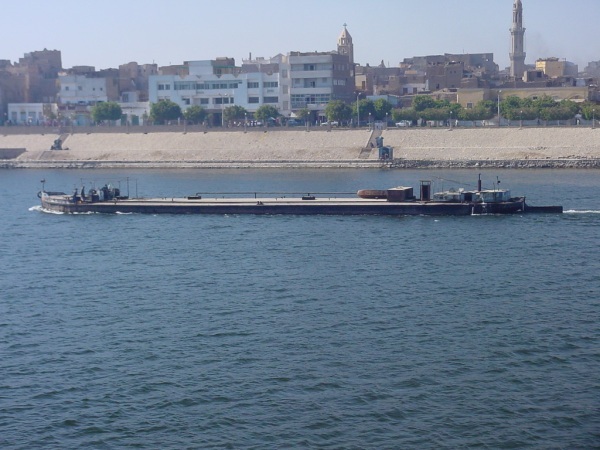 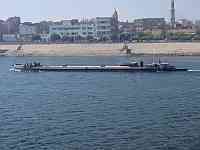 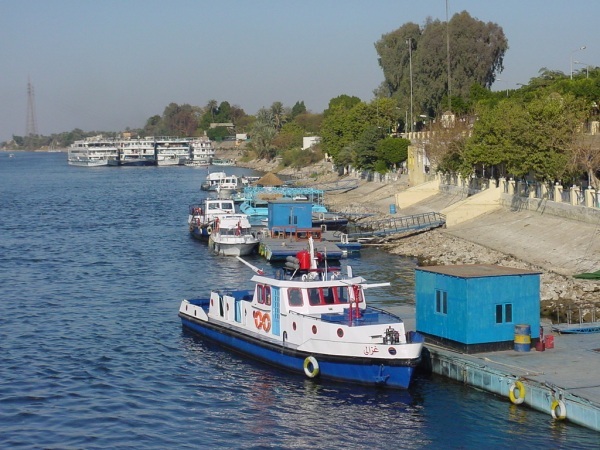 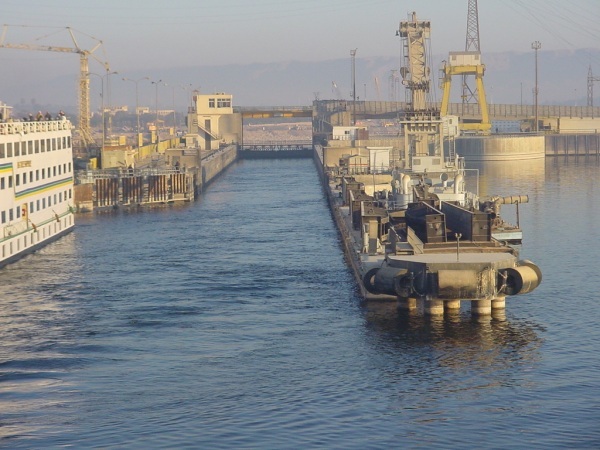 Despite the delay we still managed to reach Esna lock ahead of most other boats who had spent the night at either Kom Ombo or Edfu, but fate still had a trick in store for us. 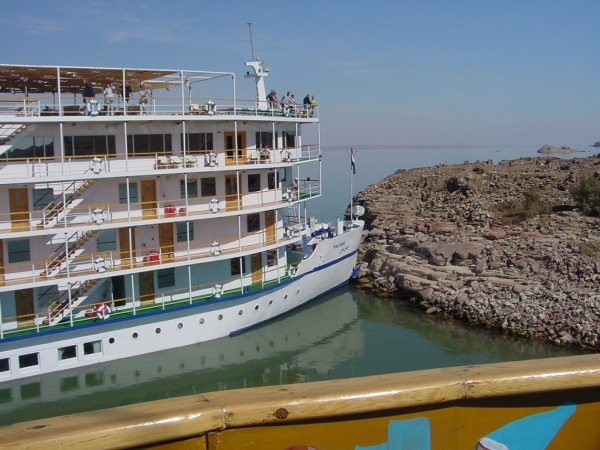 At the last moment as we approached the gates jammed half-way open, and in the ensuing emergency stop the ship bounced hard off a couple of jetties before coming to rest with the bows firmly jammed on a very rocky shore from which we had to winch ourselves free. All this was accomplished as if it were quite normal, which it probably was seeing the number of other dents in the ships which were being repaired at each stop; we were told that each ship is allowed three accidents per month, after which the captain can expect to be fined.